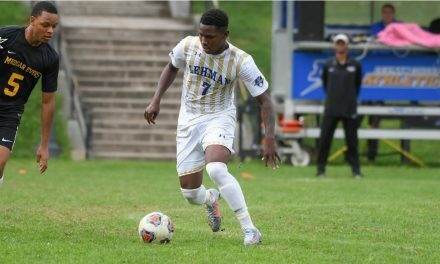 RIVERDALE, N.Y. — The Baruch College men, who played the final 61 minutes with a man disadvantage, scored two late goals for a 3-2 victory over College of Mount Saint Vincent Friday night. The visitors struck first in the 10th minute with Javier Arellano Crespo scoring the first of his two goals off a header on an assist by Adonis Martinez. 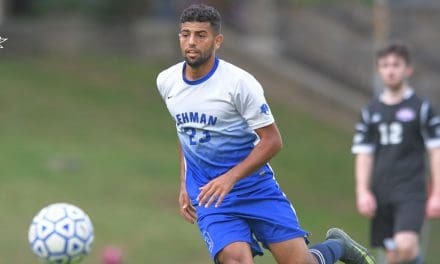 The Dolphins scored the next two goals in the 36th (Ardijan Berisha) and 76th (Cristian Perez) minutes, respectively to force the Bearcats into catch-up mode. Jacob Gorodetsky started the comeback in the 85th minute during a scramble that saw a defender’s clearance send the ball in his direction outside the box, and he kicked a rocket past the goalkeeper to tie the match. A minute later, Crespo scored on another header during a free kick by Gorodetsky for a 3-2 lead. 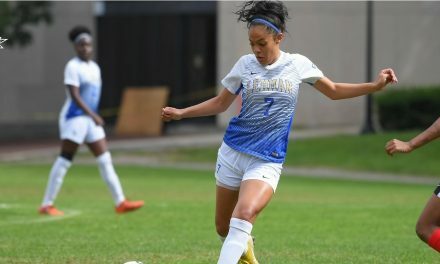 The Bearcats went a man down early in the 29th minute, but still managed to out-shoot the Dolphins, 27-9, which included a 15-4 advantage in the second half to defeat their opponent that competes in the Skyline Conference.